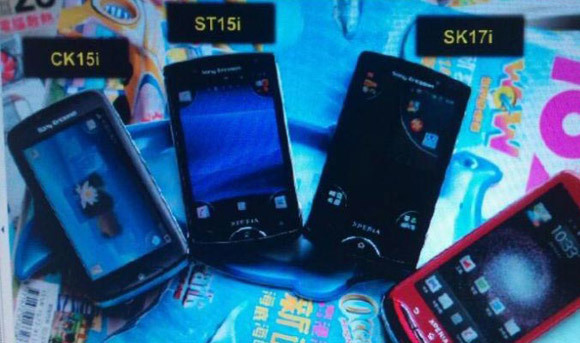 A group of new Sony Ericsson phones surfaced online and though little is known about those, we have their shots all lined up. The two most interesting members of the group are the CK15i and the ST18i. The CK15i looks to be the first Sony Ericsson non-smartphone, non-Android device of 2011. This small touchscreen handset will apparently support a 240x400 pixel display, run on SE's A200 platform and come complete with a slide-out hardware keyboard. The only other thing we know at this time is a possible name, the Sony Ericsson Txt Pro. The other mysterious device spotted is the ST18i. Even less is known about this model and due to the fact it sports the 'Xperia' moniker, will as a result probably run some iteration of Android. In the photos above you can see it has an 'HD' camera on the back, a front-facing camera, loud speaker grill and judging by the size of the sim slot, is a little smaller than the Sony Ericsson X8 with the looks of the Xperia Mini, but it's hard to tell. We're sure more information will trickle out soon enough and we'll be there when it does.